Hasselblad V series cameras were once the mainstay of portrait, wedding and fine art photographers and it is still a camera that many younger photographers now aspire to use. Many prominent fine art photographers still use V series cameras and in this context, Hasselblads are workhorses that encourage thought and forward planning to use them successfully. From my own experience, they can play an important part in bringing out the best in a photographer’s work. The square format is not to everyone’s taste and it does not suit every photographer’s eye, but once you are accustomed to composing in squares the format imbues images with a ‘new’ attention-grabbing perspective that is vastly different to the now usual 3:2 aspect ratio of ‘full-frame’ and aps-c sensor digital cameras. It’s slightly ironic that square medium format images were popular for allowing cropping options to portrait format and other aspect ratios without having to turn the camera. As with many other photographers who also use the square format, I do no crop my images, I carefully compose within the square format and this is where a more considered approach begins. A Hasselblad V series is not only a workhorse, it is also a teacher! In 2013, Hasselblad announced the cessation of manufacturing of the last of their long-running ‘V series’ of medium format cameras, the Hasselblad 503CW. There has been a lot of comment around various photography forums, mainly bemoaning the passing of an iconic camera and associated range of Carl Zeiss lenses. My view is that the decision was inevitable, if no one is buying a product why waste resources marketing it? The world of digital photography has moved on apace and there will be a vast pool of used V series equipment and Zeiss lenses available for some time to come. Whether investing money into a defunct camera system is a good idea in the long term is usually questionable, but the option remains viable with Hasselblad V and F series cameras. This equipment was built to last and deserves the legendary status that surrounds it. My original intention back in 2006 when I bought my 503CW was to add a digital back to it, but as I’ve variously blown hot and cold over that idea, I will be keeping it to shoot film for the foreseeable future. You can buy a lot of film and processing for the cost of a digital back and my Imacon scanner takes the post wet-processing workflow to the next stage. I’m one of those photographers who sees scanning and digital post processing as part of the creative process rather than a chore and, truthfully, I enjoy working on my scans. The solid construction of a V series camera is reassuringly permanent and I’m comfortable with my 503CW as one is with an old friend. Fuji Velvia 50 and the 503CW are a formidable combination and I am continually searching for ways to improve my technique and extract even higher image quality from my workflow. 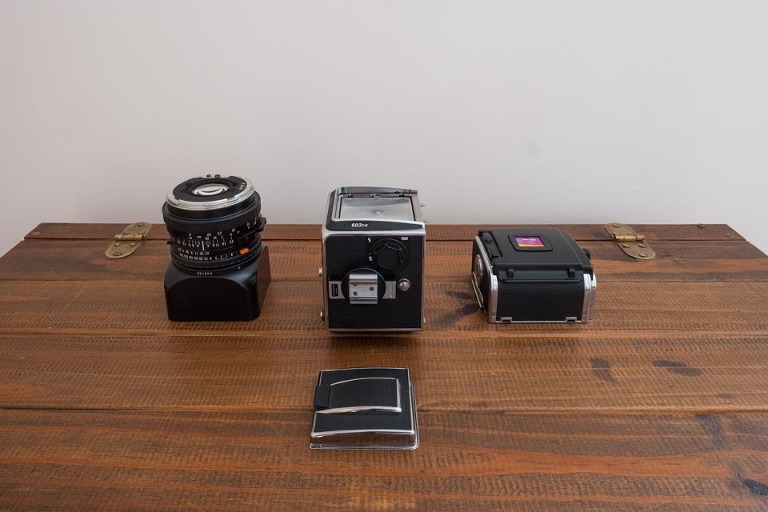 The Hasselblad 5** series of cameras are all modular and consist of the body which houses the reflex mirror, focusing screen, winding and cocking mechanism and rear shutter, a collapsible waist level finder with flip-up magnifier, a lens and a film back. The modular system is versatile, there are a plethora of different focusing screens, film backs and viewing prisms to add to the camera. I find the PME 51 metering prism very useful for correct placement of neutral density graduated filters and surprisingly accurate as a light meter. Zeiss lenses for the Hasselblad V system cameras are legendary, especially so since the advent of T* multi-coating. From the earliest lenses to the latest for the V system, Zeiss lenses have been consistently superlative. 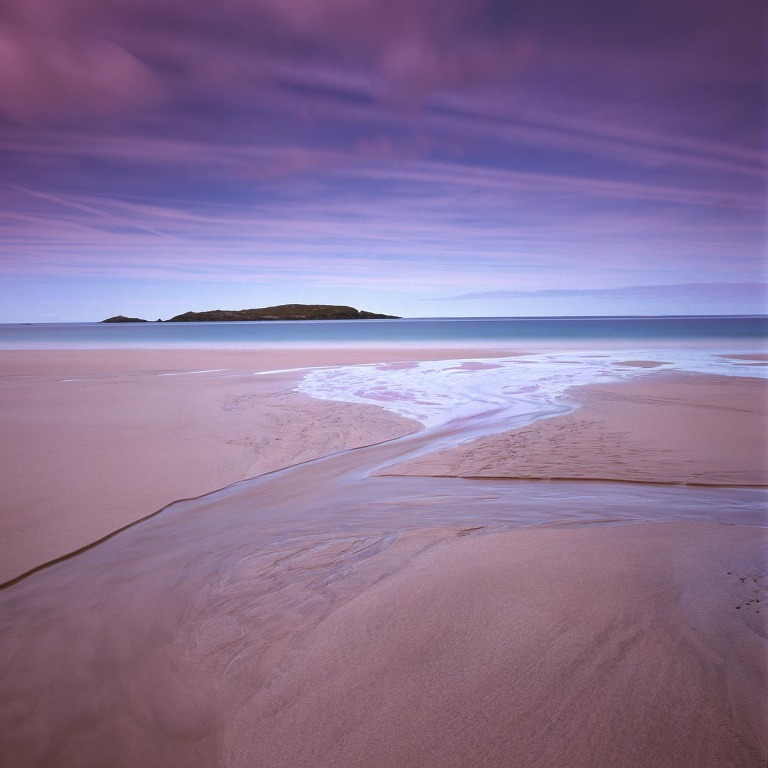 There is a quantifiable quality that you will see in a Velvia transparency, created with a Zeiss lens, on the lightbox. They are rich and sumptuous and recognisable and that says a great deal. As much as I liked my Mamiya 7(ii) and Sekor C 43mm f4.5 with Fuji Velvia, I still prefer the Zeiss T* distagon combination when I compare transparencies on the lightbox. 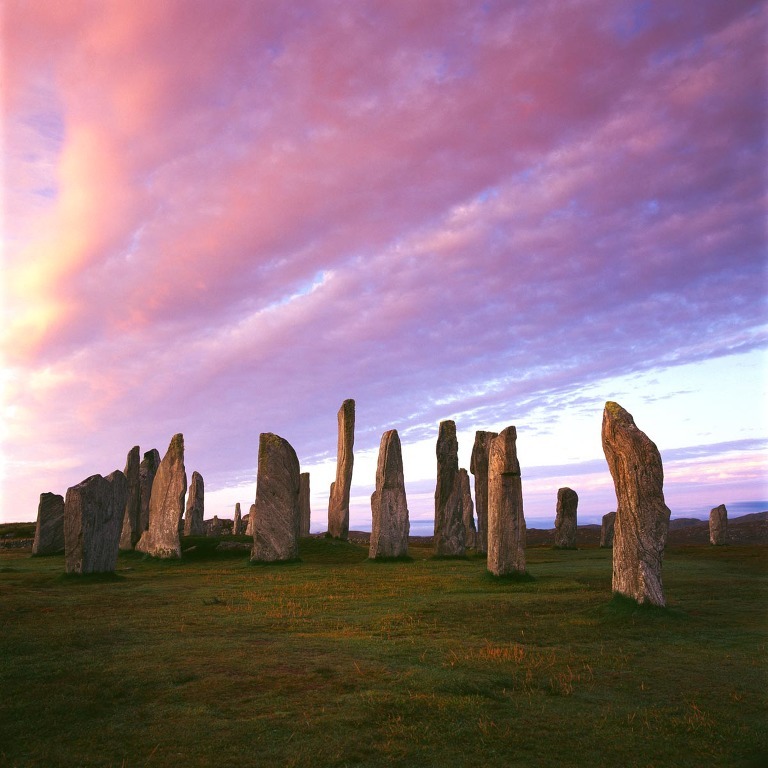 What is the best lens set on V series Hasselblad for landscape photography? I use the classic set of the Zeiss 50mm distagon f4 cfi, Zeiss 80mm planar f2.8 cfe and Zeiss 150mm sonnar f4 cf. The 50mm distagon cfi is wide enough and the 150mm sonnar cf is long enough or my needs on square format. I have never felt the need to add a wider or longer lens to this modest set because I find it so versatile. The real impact of 6x6cm for me is when isolating elements within a scene to condense the composition rather than the expansive views that are better suited to other formats such as 6x9cm, 6x12cm or 6x17cm. There isn’t an answer to the question but a Hasselblad allows you to define your style, it becomes an extension of your vision and your preferences and direction will soon become clear. A roll of Velvia 50 on the lightbox will reveal the clarity and fidelity of the Zeiss lenses and many famous names have been established with these cameras. A regular Hasselblad user understands why it can be a lifelong photographic companion. As always, the march of progress often has unwelcome side effects and the loss of the V Series for many, myself included, was one very unwelcome side effect of the consumer-driven photography industry. We are unlikely ever to see the likes of the Hasselblad V series again. Fortunately all is not lost and there is a thriving second hand market for the V and F systems. Parts are still plentiful and specialists who offer servicing continues to support loyal users well and will do for some time to come. Now is as good a time as any to buy a Hasselblad V or F series! Hasselblad V series cameras can, and do, jam. This happens if a lens is removed before the shutter has been recocked and the cocking drive screw will not line up correctly with the slot in the lens when you try to attach a lens again. If this happens, do not force the lens onto the camera! It’s worth investing in an unjamming tool as illustrated above. They are frequently obtainable from Ebay and make unjamming a Hasselblad very easy. The shutter release is threaded to take standard cable releases. The wide strap is perfect for carrying the camera. I prefer the cross-shoulder method of carrying cameras and the wide webbing is very comfortable. The Hasselblad 503CW was the last of the line. If you are thinking about getting one then don’t wait around, just do it! 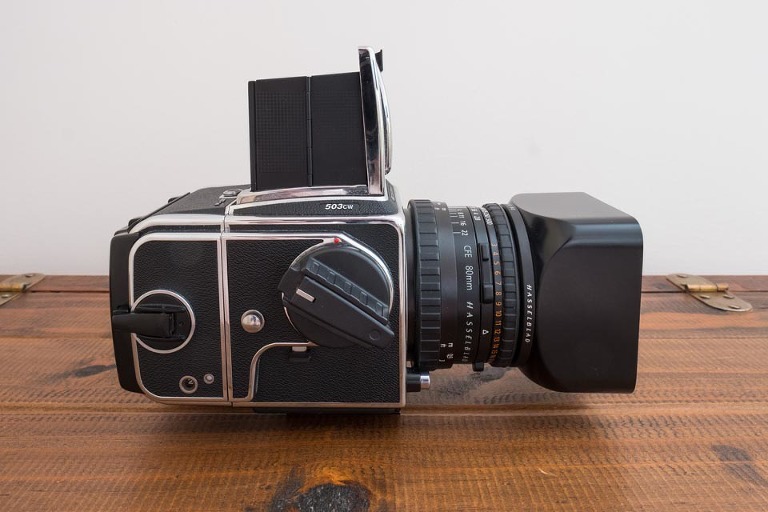 Good condition examples are readily available, but prices seem to be climbing as they are with many other medium format cameras in the face of the resurgence of interest in film photography. You will be rewarded with a reliable workhorse that is very easy to bond with and when you see those transparencies and negatives on the lightbox, you will understand exactly why you made a good decision. If you are a committed film photographer, you will have a camera system for life!